Join the Central Arkansas Rescue Effort for Animals (C.A.R.E.) 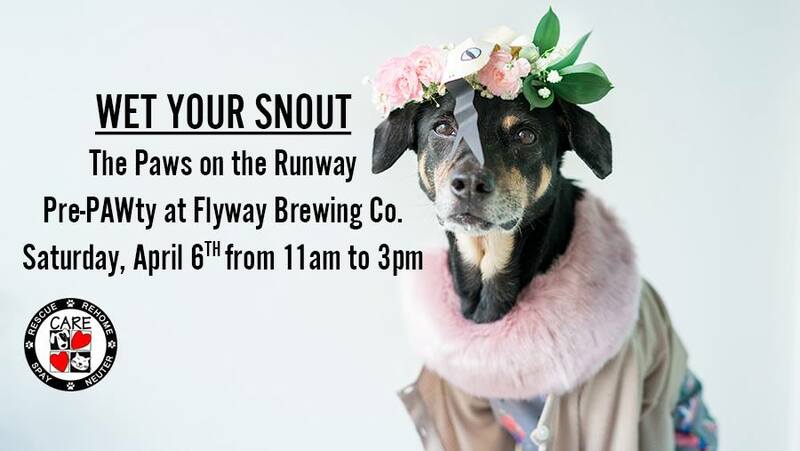 at Flyway Brewing Co. and ~Wet Your Snout~ at the pre-Runway event of the year! On Saturday, April 6th, from 11am to 3pm, Flyway will be hosting it’s first ever pre-Paws on the Runway “Yappy Hour” benefitting C.A.R.E. proceeds from all going back to C.A.R.E. Enjoy a beer at our tent outside and check out the Adoptable Pooches joining us at C.A.R.E.’s tent, play some Good Boy! Baggo, or grab a stool on our Red Carpet Patio with your own Best Friend! – Bring your Favorite Companion dressed up and receive a $1 off your first beer! – Contribute to our Flea & Tick Preventative Drive for your chance to enter a Raffle for a Flyway Gift Pack!